Capitol Physical Therapy is proud to announce that Joey Ganske, PT, DPT, OCS has received training and earned the professional designation of Orthopaedic Certified Specialist (OCS). 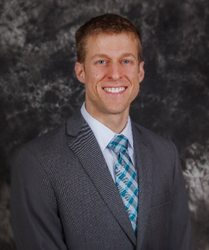 Capitol Physical Therapy, Wisconsin’s Private Practice of the Year Recipient, is proud to announce that Dr. Joey Ganske, PT, DPT, OCS received training and earned the professional designation of Orthopaedic Certified Specialist (OCS). This board-certification is granted by the American Physical Therapy Association (APTA) American Board of Physical Therapy Specialists (ABPTS), where only 3.9% of therapists in the United States are Orthopaedic Certified Specialists. This board-certification involves rigorous application and examination processes and provides assurance to patients and the medical community of Dr. Ganske’s skills and abilities. He is recognized for advanced knowledge, experience, and skills in the practice of orthopaedic physical therapy and the conditions affecting bones, joints, ligaments, tendons, muscles, and nerves. Dr. Ganske is currently a staff physical therapist at the Madison location. He is a proud graduate of Bradley University in Peoria, IL, where he earned a Doctor of Physical Therapy (DPT) degree. Besides treating orthopedic conditions he is an expert in the area of vestibular rehabilitation and LSVT BIG, a research-based treatment program for Parkinson’s disease. In his spare time he enjoys running, biking, and exploring the many Wisconsin parks with his wife, Laura, daughter, Olivia, and golden doodle, Monte. For more information about Capitol PT, please visit capitolphysicaltherapy.com. Capitol Physical Therapy is a private physical therapy practice with locations throughout Dane County. They deliver hands-on physical therapy based on the newest research to achieve the best results for patients with bad backs, achy joints, wounded limbs, ‘female’ issues, and work injuries. Along the way, the Capitol PT team has fun and makes family-like relationships with their patients. Perhaps this is why they were voted Wisconsin’s Private Practice of the Year in 2016 by their peers in the Wisconsin Physical Therapy Association. For more information visit their website at capitolphysicaltherapy.com or find them on Facebook and Twitter.